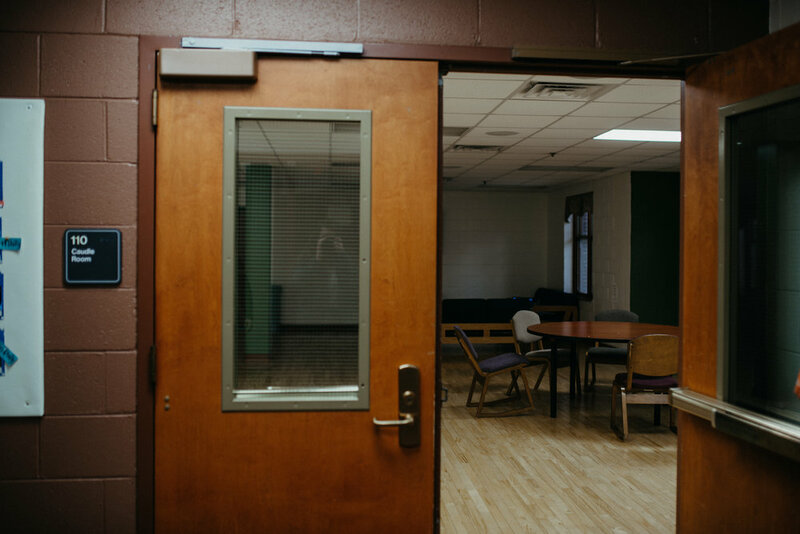 In Founders, the halls (except for Catacombs and 1st Belz) are located off of large, central lobbies fitted with couches, study spaces, and TVs that the whole Founders community can use without the restrictions of open hall hours. Carter has a recently renovated community area situated in the mailroom, with study spaces and a TV. The closest building layout to Mac is Andreas, which also has hall-specific common spaces and a single first-level lobby, with a key difference: students must walk through the Andreas’ lobby to reach its elevator. The Caudle Room, Mac’s only building-wide common space, sits behind two sets of wooden and glass doors. It isn’t the most inviting place: home to a few round tables and the recent addition of two couches and a TV. Located behind the elevator and stairs which lead to each floor, there is little need for students to walk through the Caudle Room on their day-to-day paths. Caleb Keitt (‘20), the current RA of Lawrence, has recognized since his freshman year that Mac has the reputation of being more quiet, with people preferring to spend time in their own rooms or in their halls’ individual common rooms at the opposite ends of each floor. Keitt said, “I literally think it's because of the doors [to the Caudle Room]. We've talked about if we could open the doors and keep those open more often, [...] but we can't leave them open all the time because of the fire code. I'm not saying that we should just disobey fire code, but it would be nice if there was a way around that we could be safe and still, at the same time, make it... a room where people can go into and have a casual time." Michelann Settle (‘20), who lived on Harambe! her first two years at Covenant, said about the Caudle Room, "It was so awkward! I think it was good in that it's a good space to have things, like hall or organized events if you got the lighting right. As a functional space, for me, it was not the place to go. As far as that affected the community of the building, I just think it definitely could have been used as a community building space, but the fact that it just wasn't convenient just made it not that for a lot of people." While the resident life staff in Mac can't make the location of the Caudle Room more convenient, they are working to make it more appealing. When Andrea Lopez, the building’s new Resident Director, arrived at Covenant three months ago, she had been briefed on the individual greatness of the halls and the strong hall identity found in Mac. Lopez had been encouraged by the quality of the brother-sister hall bonds in Mac, but still felt that more could be done to strengthen cross-hall relationships. In a bid to strengthen the appeal of the Caudle Room, Andrea has moved the RAs from spending their on-call duty hours in Mac’s RA/RD office to spending it in the Caudle Room. Every week night, the RAs plan an activity to do with students. These activities have included “Lord of the Rings” marathons, Quidditch, Just Dance, and a creation of Keitt and Esther Pruitt’s (‘20) Kopy and Paste, an event where students attempt to follow along and recreate Bob Ross paintings with crayons. Lopez said, “Isaiah Barnfield [RD of Founders] last year had his RAs do some sort of programming during their duty time, and it worked really well. The stories I've heard of how their community grew were really encouraging, so much that ResLife as a whole decided to do that across all four buildings." The majority of the RA staff in Mac has been overwhelmingly in favor of the decision—and of Lopez. Pruitt, the RA of Halcyon, said, "[Lopez] started out asking the RAs about our experience on campus, what other buildings have done well, and what we wanted to accomplish this year personally. We would write out notecards and I've probably forgotten all of my answers but she kept them all and definitely read them. That's just the type of person she is. She’s really wanting to learn about how we can best be faithful to what's right in front of us." Other ways Lopez and the RA staff have been working to strengthen community can be found in the recent women's gathering called "Sinceri-Tea," where the women of Mac got together for a time of fellowship with Lopez and Sarah Ocando. This allowed for cross-hall conversations that would not have happened otherwise. Lopez said, "If I could pick a motto for Mac, it would be ‘Deeply Rooted:’ the idea that the students here are digging into life, digging into their relationships with the Lord, digging into their relationships with other people, the academics they're learning, and that all of these are intersecting." The final way that Mac is working on building community is through their Open Hall activities. Mac lacks the walkthrough competitions of other buildings, such as Carter Christmas, Around Founders, or Down in Andreas. They have little opportunity to welcome out-of-building students into their community and traditions. Hannah Groenendyk (‘21), the residence hall president, came up with the idea of mini walkthroughs to build Mac community, one each month, hosted by different halls. Two have already happened: Lawrence Luau and Rowen Open Mic. While not marketed outside of Mac, residents from other buildings did attend both events. The Open Hall events have become a mode of strengthening cross-hall relationships in Mac, and they hint at the possibility of a more unified Mac in the future.